Many drivers have seen another car pulled over with a driver changing a tire. However, many more don’t know how to change their own car tire if something were to happen. What tools do you need to change a tire? What is a safe place to do it? Use this guide to know what to do! Nobody wants a flat tire, but for many drivers, this happens every day. 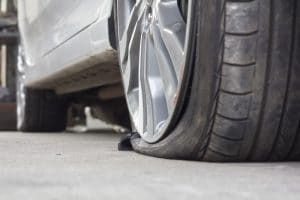 Often, drivers will get a flat tire because of an object in the road hitting, ripping or puncturing a tire. Other times, wear and tear on a tire will cause the rubber to become thin enough that it finally breaks. That is one reason why you want to track how much you drive and how long you should have a set of tires. Every driver should plan for emergency situations and hazards on the road. One of those things to prepare for is knowing how to change a tire. To start, you want to take inventory of the accessories your car comes with. Most cars will actually come with a spare tire located on the back of the car or in the trunk. Like many other pieces of technology, your car will have an accessory kit that generally includes a car jack and a lug wrench. That wrench will look like two long metal bars that make an X. There will be a socket on one end and the other will have a pry bar. You need this type of wrench to change a tire. Other tools you want include alignment studs, a wheel lock and extension bars. You may or may not need these tools, but many people do. Some cars don’t come with all of these accessories, so check yours to see if it does. The extension bar will be handy for lowering the spare tire. When you pop a tire or get a flat, don’t panic. This is a natural reaction for many drivers, but you don’t want to cause a wreck. Immediately put your flashers on and slow down safely. If you’re on the freeway or highway when your tire goes, safely pull off to the side of the road if there is a wide shoulder. If possible, get off on an exit slowly and find a side street with less traffic. This can help you be safe from other drivers on the road that may not notice you working on your tire on the side of the road. Plan ahead in case your tire goes at nighttime. Make sure your car has a flashlight so you can see what you’re doing and check often that the batteries work. Have gloves as well so you don’t injure your hands when you change a tire. To be even more safe on the side of a road, the Department of Motor Vehicles recommends having flares or reflective triangles with you along with keeping your hazards on. Remove the hubcaps of the car using the leg wrench. You may not need to do this if the lug nuts are showing already. Only loosen the lug nuts instead of taking them out. Now, place the jack underneath the flat tire using your car’s manual for instructions on your specific car jack. You should be able crank up the jack easily, but at no point should you ever get underneath the car in any way. Now that the car jack is secure, remove the lug nuts completely and set aside. Gently tug the loosened flat tire towards you until it comes off. Set aside. You’ll see the lug bolts now that there is no tire. Get your spare tire and after aligning your spare tire to the lug nuts, you can push it into place. Now you’ll do the same steps in reverse. Place the lug nuts back into their proper place WITHOUT using the wrench. You don’t want them too tight. Just as before, it’s time to use the jack again. Lower the spare tire with the jack until the tire is lowered all the way to the ground. Remove the jack and set aside. Now, tighten your lug nuts all the way with the wrench. The DMV recommends making the lug nuts very tightly into a “star” shape for proper alignment. Add the hubcap to the spare tire and secure it into place. If the tire pressure is good, you are safe to use your spare. Only use this spare minimally and never go above 50 mph on a spare. Many people will need to change a tire or two when seasons change. When you want to change a tire (or all 4), it’s generally best to leave the work up to a professional. Some people want to cut costs by trying to do it themselves, but they run the risk of putting tires on incorrectly. This can lead to flats or uneven wear on tires that will pop them in the right conditions. Change your tires at least every 6 years or more frequently if you drive a lot. As tire treads start to wear down, they won’t grip the road as well, especially with rain or ice. Rotating your tires is something generally included in a maintenance package. Rotating tires helps to even out wear on tires that can happen unevenly depending on how you drive. For rotating your tires, or for information on how to change a tire, call Scott’s Fort Collins Auto today at (970) 682-4202!